A key suspect in the Christmas Day bombing which killed more than 40 people in Nigeria has escaped from custody, police have admitted. Kabiru Sokoto - believed to be a member of the Islamist sect Boko Haram - was arrested on Saturday in the capital Abuja after police trailed him. But the very next day, he escaped as police attempted to search his house outside the capital. A police commissioner has been arrested, police said in a statement. It is a huge embarrassment for a nation struggling to contain an increasingly bloody campaign of violence blamed on Boko Haram, observers say. Meanwhile, the security forces say they arrested six Boko Haram members on Tuesday in the north-eastern town of Maiduguri, where the group is mainly based. Officials said the arrests came amid a raid in which two soldiers were killed. This is the first time the police are in the firing line since President Goodluck Jonathan said militant Islamists Boko Haram may have infiltrated the force. The question everyone is asking is how could such an important suspect have got away so easily? Police chiefs have accused their own commissioner of "serious negligence" and are treating this as a criminal case. A top state official from a Boko Haram stronghold, when asked if there was collusion between the militant sect and police, said "it would not be surprising". It beggars belief that a see-through truck with only a handful of officers would take a prime suspect on a tour of their home town just hours after their capture. Yet that is exactly what happened. When an unarmed group of young men spotted who it was, eyewitnesses say the policemen did not even use their guns to scare the mob off, as their man was hurried away. Fatally, reports suggest an innocent person was killed when they finally took up the chase. 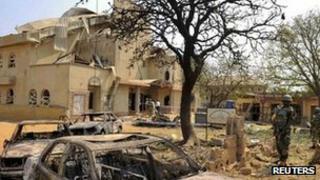 Authorities say Mr Sokoto planned the 25 December bombing of St Theresa Roman Catholic church in Madalla, just outside Abuja. He was arrested on Saturday in Abuja at a lodge owned by the governor of Borno state, Kashim Shettima. A spokesman for the governor has said there is no question of collaboration between the governor and Boko Haram. "What we've heard is that this man is in that lodge perhaps to even harm the governor. One cannot be in governance and be collaborating with people who threaten the peace of your own region," Inuwa Bwala, Borno's commissioner of information, told the BBC's Focus on Africa programme. "Our governor is completely insulated from any blame or from any type of relationship with these people." The next day, the suspect was taken to his home just outside the capital, which police intended to search. But youths surrounded the police cars and pandemonium broke out during which the suspect managed to escape, the BBC's Mark Lobel in Nigeria reports. In a statement, police said Boko Haram members had attacked police escorting Mr Sokoto. "The police view this development as a serious negligence on the part of the commissioner of police and have since queried and suspended him from duty," it added. The commissioner was not identified. This is either huge incompetence or worse on the part of the police, our correspondent says. Mr Sokoto was the only major suspect to be arrested of late for involvement in the bloody attacks blamed on Boko Haram, which has stepped up its attacks over the last year. The group started to stage drive-by shootings in 2010 on government targets in its base in Maiduguri, where some arrests were made on Tuesday. On the brink after north-south clashes? "We have succeeded in arresting six high-profile members of Boko Haram in a raid on their hideout following useful information provided us by some residents," a commander of the security forces in the city, Victor Ebhaleme, told the AFP news agency. Last year, Boko Haram carried out suicide bombings on high-profile targets such as the headquarters of the UN and the police in Abuja. President Goodluck Jonathan has voiced concerns that members of Boko Haram have infiltrated government offices and security agencies. Suspicion is now hovering that there may have been some kind of collusion between the police and Boko Haram, our correspondent says. Reports suggest the group has been blamed for at least 74 killings this year alone. The group, whose name means "Western education is forbidden", wants to establish Sharia (Islamic law) in Nigeria. Nigeria, Africa's most populous nation with 160 million people, is divided between a largely Muslim north and a south where most people are Christians and some animists. In a video recently posted on YouTube, Boko Haram's leader Abubakar Shekau defended recent attacks on Christians, saying they were revenge for killings of Muslims in several parts of northern Nigeria. He said the group's primary targets remained the security forces, who he said had summarily executed their former leader Mohammed Yusuf after he was arrested in 2009. Despite its vast resources, Nigeria ranks among the most unequal countries in the world, according to the UN. The poverty in the north is in stark contrast to the more developed southern states. While in the oil-rich south-east, the residents of Delta and Akwa Ibom complain that all the wealth they generate flows up the pipeline to Abuja and Lagos. Nigeria's 160 million people are divided between numerous ethno-linguistic groups and also along religious lines. Broadly, the Hausa-Fulani people based in the north are mostly Muslims. The Yorubas of the south-west are divided between Muslims and Christians, while the Igbos of the south-east and neighbouring groups are mostly Christian or animist. The Middle Belt is home to hundreds of groups with different beliefs, and around Jos there are frequent clashes between Hausa-speaking Muslims and Christian members of the Berom community. Southern residents tend to have better access to healthcare, as reflected by the greater uptake of vaccines for polio, tuberculosis, tetanus and diphtheria. Some northern groups have in the past boycotted immunisation programmes, saying they are a Western plot to make Muslim women infertile. This led to a recurrence of polio, but the vaccinations have now resumed. Female literacy is seen as the key to raising living standards for the next generation. For example, a newborn child is far likelier to survive if its mother is well-educated. In Nigeria we see a stark contrast between the mainly Muslim north and the Christian and animist south. In some northern states less than 5% of women can read and write, whereas in some Igbo areas more than 90% are literate. Nigeria is Africa's biggest oil producer and among the biggest in the world but most of its people subsist on less than $2 a day. The oil is produced in the south-east and some militant groups there want to keep a greater share of the wealth which comes from under their feet. Attacks by militants on oil installations led to a sharp fall in Nigeria's output during the last decade. But in 2010, a government amnesty led thousands of fighters to lay down their weapons.